CHASING WARBLERS AT BRANDON MARSH. On Monday morning I popped over to Brandon Marsh to try and get some shots of Warblers.As I started to walk round I was disappointed to find a cold wind still blowing and it wasn't so bright as forecast. This could have been the reason why I struggled all day. It took me ages to find a Common Whitethroat. I failed to get any shots of the Blackcaps I saw they were all in skulking mode.It was pretty easy to get some decent shots of Willow Warblers though. I failed completely with Sedge and Reed Warblers which I heard well enough but never saw.I didn't even hear a Cettis Warbler.I think the numbers are well down.Did find a Garden Warbler though and managed a single shot. I was very surprised to hear that yesterdays Wood Warbler was still about and even more surprised to get a couple of crappographs.This Wood Warbler had been to the Goldcrest branch hopping school and never was still for a second.Very nice to see though. Just as hard to get a shot of were a pair of Lesser Whitethroats that my good friend Jeff Rankin put me onto.The little devils skulked deep in the bushes and I wasted so many shots as I couldn't focus on them. 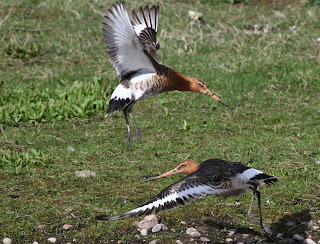 BLACK-TAILED GODWITS AT MARSH LANE. Had an exciting but ultimately frustrating time on Thursday morning at Brueton Park nature reserve chasing a Wood Warbler that had been reported there.Thanks to John Oates who tracked it down I did get a few very good views but frustrating because I didn't get one shot.The only shot I did take that morning was of one of the hybrid Whooper Swans. On Friday morning as I was very near arriving at Brandon Marsh (decided to go there as a change to Marsh Lane) I received a call from John Oates "31 Black-tailed Godwits from Oak hide"
How annoying it is to go to one place and all the action is at your local patch.Turned the car around and headed back to Marsh Lane hoping they had not flown.They hadn't luckily !!! 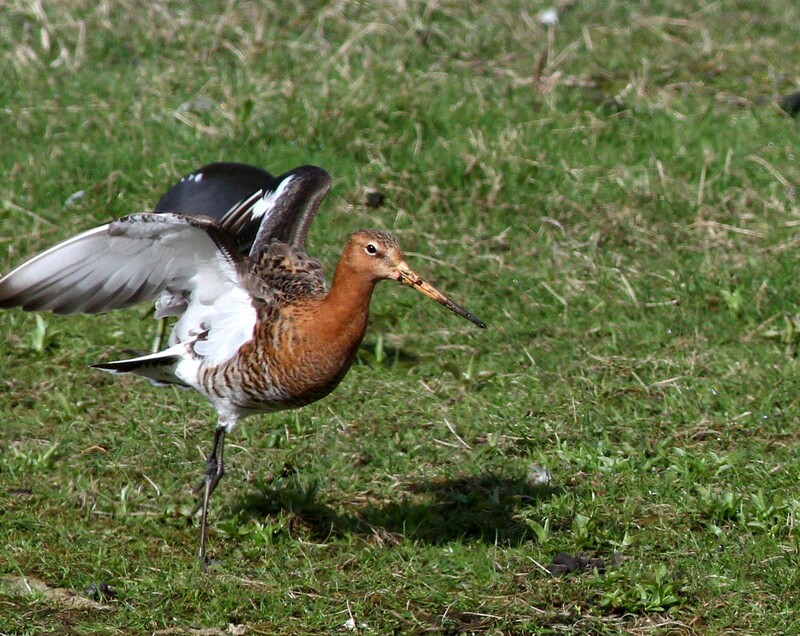 Got this Dunlin shot also from the Oak hide. I was surprised to see all the Black Tailed Godwits on the island in front of the hide.They were all busy feeding and it was quite hard to get a shot with their bills not buried in the ground.Fabulous birds.Very enjoyable. All of a sudden there was a side show.A drake Mandarin turned up and seemed to take over a Mallard family. Have been a good birder lately and have checked out Marsh Lane nearly every day. 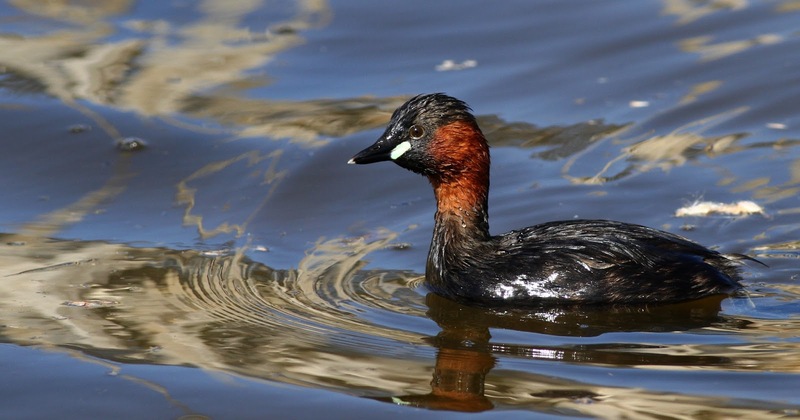 Didn't have the same success yesterday as I had on Monday with the camera and only got this Little Grebe.Others heard the Grasshopper Warbler reeling but I didn't. This lunchtime I had to dash from the car park to the hide as a sudden shower arrived.This Little Ringed Plover was not worried by the shower although it looked angry when it first spotted me. 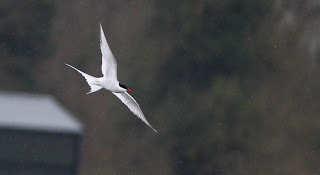 I then had some fun and games trying to get some flight shots of an Arctic Tern that was whizzing round the Railway pool but I had very little success.It was too distant and much too fast but very nice to see. 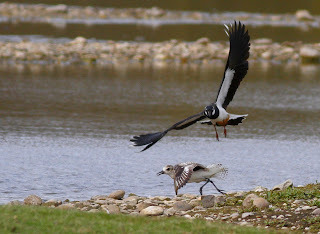 Then disaster struck and it's all down to me.As I walked to the Railway hide I spotted a Mandarin Duck flying in.I'd never seen one at Marsh lane before so I was keen to get some shots. Soon spotted it on a nearby island but when I tried to focus the camera on it nothing happened.The battery had run out.What a burk !!!!! 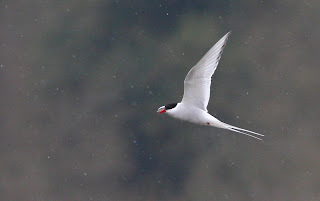 I had wasted far too many shots on the Arctic Tern. GRASSHOPPER WARBLER AT MARSH LANE. Now that I know for sure that it was definitely a Grasshopper Warbler I found at Marsh Lane I thought I'd post all the shots I took instead of just the one included in my last post. I was a bit lucky to be honest because as I was walking the path from the Oak towards the Railway hide I spotted this bird perched on top of a bramble.It was not calling.I did not know what it was but I have learned my lesson to take some shots and find out later. It wasn't till several hours later when I was going through my shots that I thought it might be a Grasshopper Warbler.My friend John Oates confirmed the ID.A very nice find for Marsh Lane or anywhere for that matter. 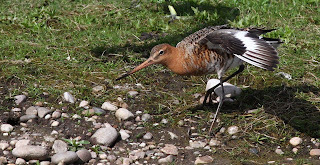 A VERY RARE BIRD AT MARSH LANE. Don't get too excited it was only very rare because I found it and I hardly ever find anything. First things things first I'd gone down to Marsh lane again on Monday morning hoping that something decent had dropped in.The Willow Warbler that has taken to give concerts just past the causeway screens was in a good mood and was happy to pose for some shots this morning. I then had a brief look at a bird I could not ID (nothing new there then) and could only grab one shot before it disappeared into the brambles by the back gate pond. I'm hoping it's a Grasshopper Warbler but that could well be wishful thinking. It was after I'd been in the Oak hide for the second time for a while when I spotted a bird that had just dropped in.My companion (name withheld on request) said it was a Ruff.I soon persuaded him it was a Plover but which.Grey or Golden ? A quick call to John Oates helped us to ID it as a Grey Plover.A very nice find. The other birds took a dislike to this very nice looking bird in particular the Lapwings and it was chased around a lot. 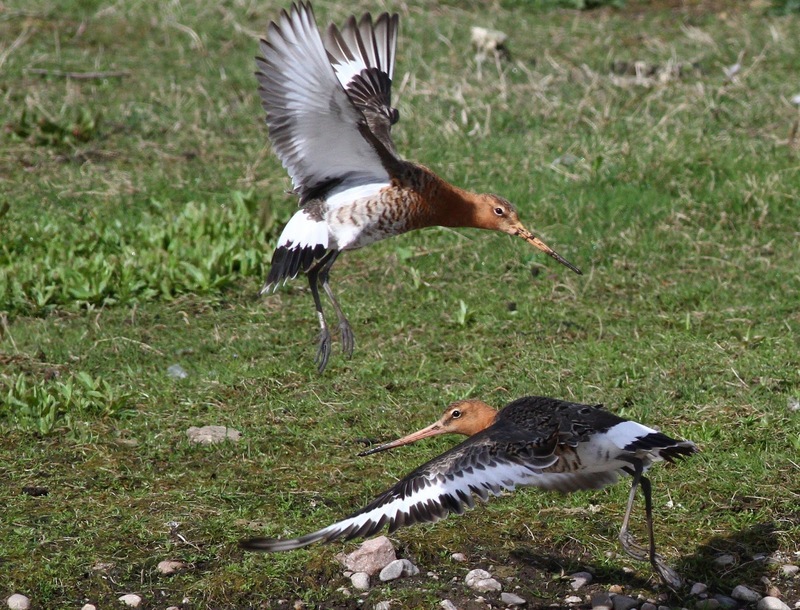 Eventually it landed not too far away and I was able to take some shots.Hardly ever seen these chaps in land. LATE PS : It is a Grasshopper Warbler.Confirmed by the top guys.Wow !!! Didn't realise at the time.Hope it stays. A COUPLE OF QUICK VISITS TO MARSH LANE. Hoping that something really good would drop down to Marsh Lane on migration I made another couple of visits with fingers crossed. On Friday I found 3 Yellow Wagtails on one of the railway pool islands.A bit far off for my lens but the one on the right might be a Blue-headed although the jury is still out on that. 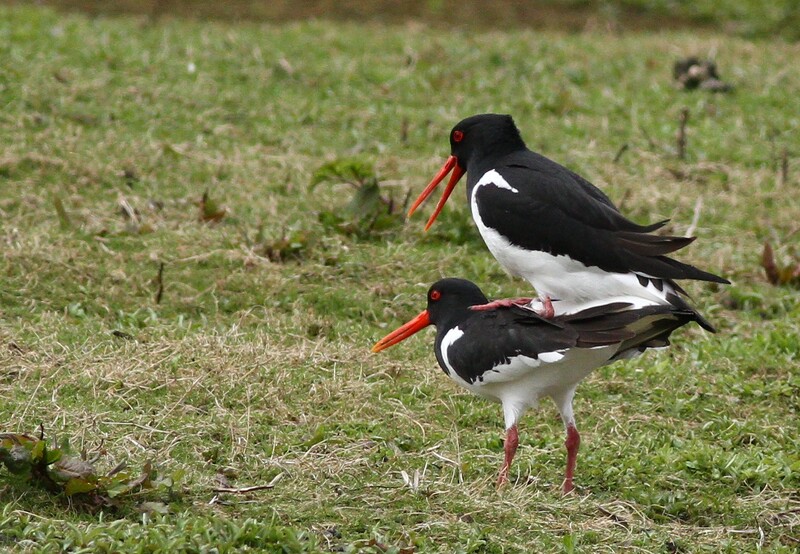 A couple of Oystercatchers were being amorous on a nearby island.What disgraceful behaviour !!! Did manage a few shots of one of the Willow Warblers in the back gate coppice. That was it I'm afraid.No great rarities.I went down early on Saturday morning to try again.The causeway area was very busy with many birds looking for nesting material. Blowed if I could get many shots though and I kept missing the Sedge Warblers in the reeds.I did get my first shot of the year of a Common Whitethroat though. There was a distant Barnacle Goose on the far bank of the railway pool but that was it.No rarities dropping in. ANOTHER QUICK LOOK AT MARSH LANE. Yesterday lunchtime I drove over to Marsh lane hoping that the showery weather had brought something decent down.What I had not allowed for was the very strong wind that was blowing straight into the hides. Found two Sedge Warblers from the northern causeway screen but they kept too low for any pics.First of the year for me. Nothing new from the Oak hide but as I battled with the wind blowing in I managed a few shots including the much under appreciated Gadwall. From the car park hide I at last got onto a White Wagtail but it was so far away I think it might have been just inside the Worcestershire border. 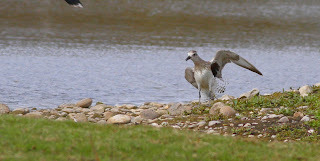 Best of all there were at least three Common Sandpipers on the car park pool islands.